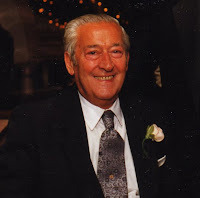 Sal Sr., my grandfather, possessed an indescribable cool; a Dean Martin poise most guys dreamed about. He was a man of few words, and rarely shared his opinions. He had the ability to keep you focused because of what he wasn't saying and wasn't doing. I am nothing like him. He was over six feet tall, maybe 6' 2", and he loved to smile. He was perpetually tan, though not in that George Hamilton way. He claimed his skin color came "from all those days in The Philippines during World War II." He loved the sun, and would work on that war time tan every summer day, baking shirtless on our stoop at 552 Broome Street while listening to the Yankees on his then average/now hip Norelco radio. He lived on the second floor with my grandmother, while I resided with my mother and other grandmother on the 4th floor. I ran up and down those stairs at 552 Broome Street 100 times a day. He said little, yet there was a playful, almost menacing side to his unobtrusive personality. There was no one more patient, and no one in my lifetime who hid their feelings the way he did. Two separate Saturday afternoons come to mind, where Sal Sr. exhibited that patience, that cool. There was the day my grandmother found mouse droppings in her immaculate kitchen. My grandfather silently taped up the space under every door in the apartment, and stood watch with a broom. He sat on a kitchen chair, on guard, broom upright like some twisted version of "American Gothic." He lit Salem 100 after Salem 100, for what seemed like hours, waiting for Pepino to surrender from behind the kitchen sink. He did, and the broom came down with a thwack that rattled the entire neighborhood. My grandfather stood up, bagged the rodent, removed the tape, and joined me for some baseball in the living room, all without breaking a sweat or uttering a word. Another afternoon, he had been chopping ice in that same kitchen, while I was watching baseball in that same living room. Suddenly, I heard some psychotic whistling. (I'll expound on that whistling in a bit.) The pick went through his index finger. He continued to whistle as he wiped up the blood, and fixed himself up as if the kitchen was a M*A*S*H unit. He said nothing during either of these incidents. Our family was large and loud, but mostly loud. It was newsworthy when one person at our dinner table would talk while the others listened. No one ever really listened. Sunday dinner, which began around 1:P.M., usually had 4-6, sometimes 6-8 of us around the table, competing for air time, as we were already being drowned out by the Yankees on the living room set. My grandfather's television and stereo went to eleven long before Spinal Tap. A typical meal would start politely, with food carefully passed around, and manners we'd somehow pull out of a hat for 30 seconds at a time. Then, as if plotting the sabotage since the week prior, my grandmother would come to bat, like Joe Pepitone, eager to hit one out of the park. She'd bring up some inappropriate subject for the dinner table, usually about money or another relative. This would rile my father. Then I'd chime in, usually with the old stand-by missive, "you're missing my point," even when I hadn't any. In record time, this faux-Waltons get together was a din of demented barking, with points being made to no one. Another one of my grandfather's quietly sinister moves happened during the Christmas season of 1970. He was an executive at a paper company, and every winter holiday season, he would bring home a daily supply of beautifully wrapped gifts, mostly boxed liquor bottles, given to him by co-workers and clients. My job, once we put up his tree and set up the Lionel trains, (which almost always never worked, as the transformer would inevitably burn out on the first go around) was to arrange the bottles and other wrapped goodies under it. 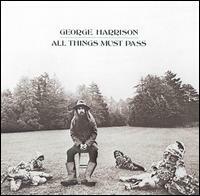 That year, just a few weeks earlier in November, George Harrison's 3 LP boxed set "All Things Must Pass" was released. This was all I focused on that holiday season. That was all I really wanted for Christmas, or any other day, for that matter. I must point out, I was not a patient kid. By the 18th of December, I'd start sleeping less. I was sweating in below zero temperatures. I couldn't eat. The excitement of the holiday, not to mention a new Beatles' related album, was enough to drive me out of my skin. This is turn, would drive all in my presence, out of theirs. Still I pressed on, every evening, waiting for my grandfather to come home from work with the bottles. The ritual continued until the night that turned my Burl Ives' Christmas into a long-term, seasonal twitch. My grandfather came home with a half dozen bottles and a box that measured about 12"x12". (That was the right size, I thought.) I just knew it was "All Things Must Pass." He handed it to me with that same smirk he sported right before the whistling. So I asked, "This is the George Harrison album, right?" He corrected me, "No, Salvatore. It's a box of handkerchiefs from Betty." (Betty was his secretary. And yes, he called me Salvatore.) He smirked again. I'm sure I laughed some nervous laugh as I held back the tears. "No it isn't. Right? It's my record, right?" My grandmother bellowed from the kitchen, "SAL! WILL YOU NOT TORTURE HIM PLEASE?" He just smiled wide and told me to place it with the rest of the gifts under the tree. I did not relent. As a matter of fact, for the next two days, if I was my kid, I would have put me out on the street, with a sign around my neck that said, "Take him. Good luck." Every hour, I would try to reason with him as only an unreasonable child could. "You know, it's just one I want to open. Just that one gift...so I could listen to it. Then I wouldn't be bothering you. See? That makes sense, right Grandpa? Hello? Grandpa?" It's the 23rd of December, and I was in a zone. I sat in front of the tree, staring at that box, in a "blink, or you'll miss it" mode, like I was waiting to catch a glimpse of The Yeti. "Please just that one! Just that one!" He laughed and insisted, "Salvatore, they are handkerchiefs." "SAL! WILL YOU LEAVE HIM ALONE? LET HIM OPEN IT! I CAN'T TAKE THIS!" I am pretty sure by now I was hyperventilating. "No...sob..no...it's...sob...it's the Harrison album...sob." My grandfather laughed, gave me a perfunctory head pat and started whistling. He reached for the box and handed it to me. He said nothing. He just smirked as I tore the wrapper off in one pull, like a pair of velcro parachute pants. I did get "All Things Must Pass" on Christmas morning. I finally got over the Christmas of 1970 in 2003. A girl in my neighborhood in Houston came knocking on my door one day, accompanied by her sister, and gave me "All Things Must Pass." I was such a knucklehead that I didn't quite get that she had a crush on me. And to this day I regret not pursuing her. great great writing--u evoke, not inform, u report, not distort.....the whistle from your grandpa musta had a secret meaning when he was younger? I have such fond memories of Grandpa Sal, at that time he was like a father/grandfather to me. I especially remember the radio Yankee games in Chelsea Park. Thanks for the article. After reflecting, it made me wonder who the better tease was? Or Grandma, for helping you BELIEVE? They must have been a great tag team. Always liked Grandpa Sal. We talked and laughed a lot over the years. He was a cool guy. Nice story as always. He was the calm in the chaos. Now for the truth. Did you re-gift those handkerchiefs? This series has to be a book, Sal. Thanks all. Boy would I love to see these stories as a book. It is unfortunate that for the last 40 years I cannot hear "Wah-Wah" without wanting to blow my nose. Great story, Sal. I have very fond memories of the Broome St. apartment. I was sooo jealous of those Bose speakers! Great story..again! Well the book has a following already..I agree!! Keep em coming Salvatore! Love it! Perfect story. And it's true - "All things must pass."